Free to Play Super Mario Sunshine 64, start your free game now (2016). Description: Enter another adventure with Mario in Super Mario Sunshine demo 64. 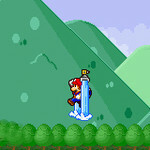 Choose between two levels and finish their enemies with the help of its water jet to climb! Remember to pick up more water in the pools.